Get Ready For A New Look! Trinity’s men’s ice hockey team takes on the Ephs of Williams under the lights at Boston’s Fenway Park as part of Citi Frozen Fenway 2014 on January 7, 2014. The Bantams lost a hard-fought game by a final score of 4-2. 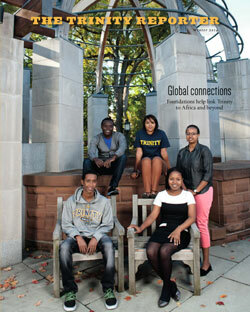 Five MasterCard Foundation Scholars join the Trinity College community. Use the drop down menus in the black navigation bar to read the articles in the Winter 2014 issue of The Trinity Reporter.